Let's just get this out of the way. I like this mod. I like this mod a lot. I think it looks nice, and mine is functioning (mostly) perfectly. I have heard stories of this mod not functioning as it should, and I have had a few, minor issues, but, I still like this mod. What have I heard? Some have said that it won't charge oas it should. Some have said that they can't get it into or out of TC mode consistently. Some have said that the finish on the colored mods does not hold up. Some have said that the battery life is inflated and not accurate. How about some specs, a price, and a vendor? Note that the specs I am posting were either determined by experimentation on my part, or surfing the internet. Remember that I did not receive a manual. 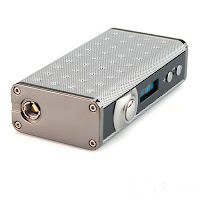 It's a box mod capable of firing from 1 watt up to 165 watts with the right build. It houses an internal 4000 mAh battery 75 Amp long term discharge. It will fire between 0.08 – 1.0 Ohms in Temp Control Mode, and 0.16 – 2.0 Ohms in power mode. It sports a nice, bright, easy to read DNA style screen. 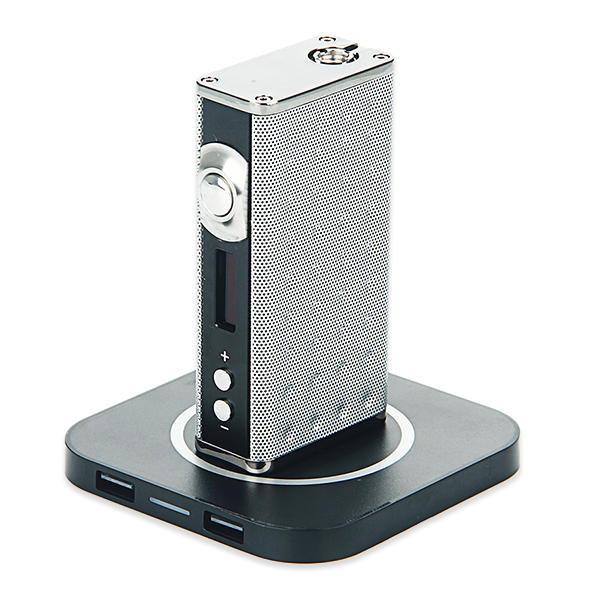 It supports and auto-senses Ti and Ni200 coils. The temperature range is from 100 to 300 Celsius (in 5 degree increments) or 200 to 600 Fahrenheit (in 10 degree increments). Adjusting above 300 C or 600 F turns TC off. Attaching a new atomizer (or reattaching an old one) and firing the device provides the prompt "New coil up same down." The temperature ranges round-robin when adjusting down. Five clicks turns it on and, when on, five clicks locks it. Note that the clicks need to be nicely spaced... rapid-fire will just confuse you and the mod. Clicking the up and power button simultaneously for 3 seconds (or so) turns it off. Pressing the up and down buttons, when unlocked, provides the prompt "Hold to change temp" in wattage mode, and "hold to change watt" in temperature control mode allowing you to switch between modes and/or adjust the desired temperature or wattage on the fly. The 510 threads are stainless steel and the center pin is spring loaded. It appears to be gold plated. It might be brass. The sides are a dimpled mesh that is very easy to grip, comfortable to hold, and looks kinda nice. One side of the device sports a mirrored finish, the other side is matte with an easy to find, mildly clicky raised fire button, the screen, and the two clickier up and down buttons. The top and bottom of the device appear to be chromed brass. The only branding on the device shows up on the mirrored edge "Eiffel" at the top and "T1" at the bottom. There is NO RATTLE at all on this device no matter how hard I shake it. 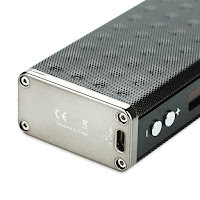 There is a Micro USB charging port rated at 5 volts, 1-2 Amps on the bottom that I have never used. The device comes with a Qi charging pad (that you can use with Qi enabled cell phones, as well, I am told) that will charge the device, and also provides two USB ports on the front for charging something else when the device is not being charged. I have never used the ports on the front of the device. After 30 minutes of inactivity, the device powers down to preserve battery life. 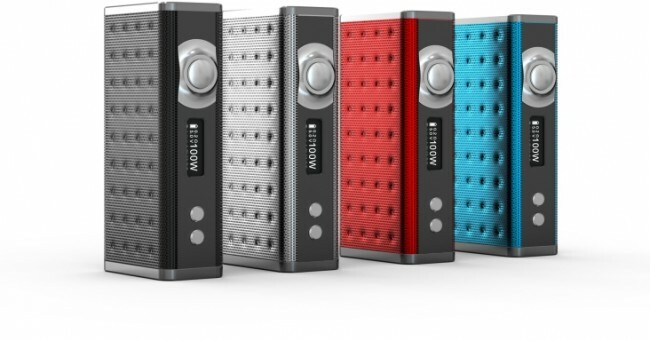 It is available in red, silver, black and blue. Mine is silver. 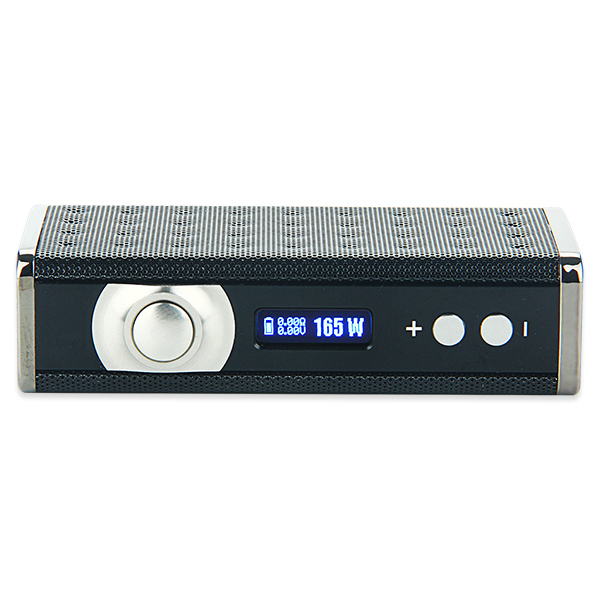 I paid $50 shipping included, but have seen it selling for around $80 with sale specials bringing it in at around $59 from Vaporider.net and others. The device will, on occasion, read a low build as TC when it is not. It still hits fine, and switches out of TC when the resistance does not change as it should for a TC build. I chalk this up as a very slight glitch likely being brought about by my builds and not the device. 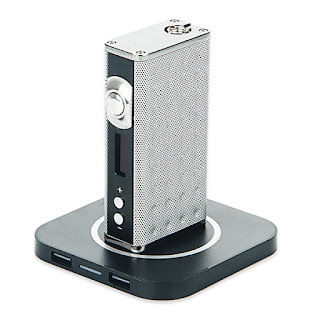 The device DOES recognize TC coils placed on the device in wattage mode and switch immediately. The device is calibrated a little high in TC mode. It will singe cotton in a dry burn test at around 370 degrees F, and will burn it at 420. It still does protect, but this miscalibration is something to be aware of. The device needs to be positioned on the charging pad in the center. Just plopping it on the charging pad willy-nilly will not get a proper connection. the indicator lights do inform of any such lack of charging by happily NOT turning blue. If it was perfectly perfect, placing the device most anywhere on the pad would initiate charging, the temperature calibration would be spot on, and it would recognize a TC coil or non-TC coil instantly and shift into the right mode. It would also cost about three times what it does, I think. It looks, I think, nice. At the very least, it is unique (there is one other mod using the same aesthetic - the Heatvape VMesh Mechanical uses the same button and similar mesh grip). It is comfortable and grippy. No rattle and acceptably clicky buttons that are easy to access and differentiate. Charging pad (and a backup Micro USB charging port). 165 watts of available power. Temperature control in Ti and Ni. When attaching the same coil after removing, the previous settings are unchanged. Speedy accelerator when changing wattage or temperature. Slight miscalibration in TC mode. The mesh can get a little gummy feeling if liquid gets on it and it's hard to clean. Slow auto-recognition of non-TC coils. The 510 connection on mine is just about 1/2 mm raised and most atties show a bit of gap. The device has to be centered on the charging pad to initiate charging. No way to manually set resistance, or adjust TCR. There is no screen flip - not really a con, but some will insist it be mentioned. Yeah, I know I put the "device powers down" in both pros and cons. It really is both. I like that conserving battery life is considered. I don't like picking up my mod, taking a big ol' hit, and getting nothing except the knowledge that I haven't had a vape for the last 30 minutes. At the end of the day, I would gladly pay full retail value to replace this mod. The feel and functionality, for me, are just great. I can easily live without stealth mode, can flip the mod over to read it (or can read it upside down), and can manually compensate for the minor errors in calibration. In fact, I am investigating Qi charging options for my phone and investing in another pad to keep at work so I can charge this way all the time on everything. Finish - 9/10 - No rattles, no sharp corners, and no crunchy threads make this a great device. The aluminum mesh is rather soft, and one section of my unit seems a bit pushed in. Form - 9/10 - Comfortable to hold without feeling slippery. Can easily be fired with trigger finger or thumb. The only point subtracted here is for the mesh siding being hard to clean and feeling gummy when not cleaned. All adjustments (except powering off) can be made one-handed. The screen is bright, readable, and perfectly centered. Function - 9/10 - Slight calibration error in TC and slow to recognize non-TC coils, but otherwise great in use. Love love love the charging pad! Final - 9/10 - A grade! This thing is crap. 2 months of using it and I keep getting "Atomizer Open" no matter which tank I try on. Exact same tank works great on other mods. What a waste! Sorry you're having issues. Mine is still working great. Have you contacted Esige? I will comment more if I can add anything. Your wife is right, daytime reviews are great when you have a rooster commenting in the background. Always good for a smile. Mine is still going strong! I've currently got a dual coil Ti build in a 757 Cardinal Kustom RTA on it. Unscrew the 4 very small screws on the bottom where the charging port is, remove the cover, gently pull the battery out and it literally says 1500 mAh. 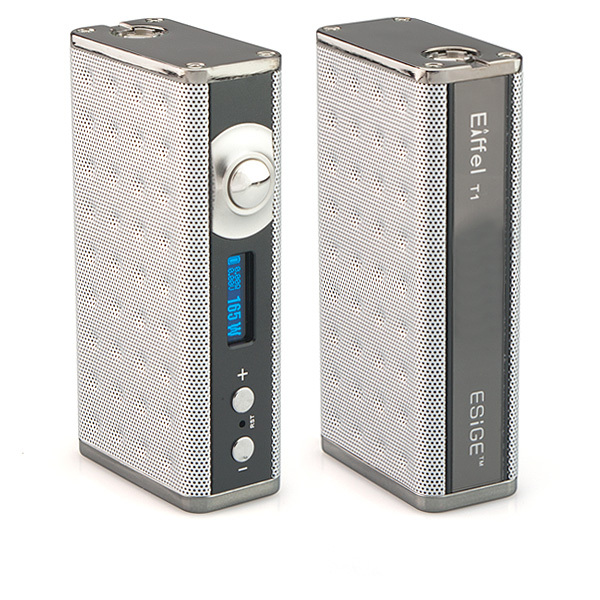 I have the red one with a aspire celito 120 tank , great vape , 1 small issue , I can't get it fully charged , it's now on charge so I'm go in to leave it and see if it fully charges , but great flavour with the aspire 120 tank , I like to vape at 65-95 watts and does it mint with a nice cool vapeer, first large mod and I do like it a lot , my chargeing pad doesn't seem to work if I'm doin it properly or not I do not no, I never paid for mine so I'm not to worried , overall mint vape , can I change the battery on it does any1 no? The battery cannot safely be replaced by the user. The Qi pad is a little finicky... clean the pad and the base of the device and get everything centered. Otherwise, the USB port works fine. As to the battery not charging fully... if the device is older, the battery might be a little old... older batteries begin to lose capacity. I ordered one of these as part of a clearance sale for a really great price, can't wait to try it out. I wonder why it didn't have more of a following. Most of the reviews seem to be positive. The company seems to have gone under. On occasion, I'll pull it out. Still working fine. I do not use it all the time, as I prefer SS TC and this device does not support it.